To offer opportunities for professional development to Civil Engineering and Architecture majors, whom would partake in the tourist developments under Therrestra. The second objective is the improvement of all infrastructure and equipment in the Civil Engineering Materials Lab, to be named “Laboratorio Therrestra” (*The Therrestra Lab), by way of a RD$5,000,000 donation. The third objective is the instauration of the Therrestra Award to Excellence, which shall distinguish academic excellence from students in the Civil Engineering and Architecture field, by assuming the educational duties payment for their studies. “I majores in Civil Engineering from the PUCMM University Campus in Santiago, and many of my staff also graduated from this university; it seemed only fair to approach the entity and underwrite this agreement”. The university chancellor, Pbro, Dr. Ramón Alfredo De la Cruz Baldera, expressed his great joy and satisfaction regarding Pérez Ovalles’ active reincorporation as well as his company, by supporting initiatives of institutional development; he valued Therrestra’s performance as a company that currently welcomes tens of alumni and assured the efficient use of this valuable contribution, by supplying cutting-edge technology resources to the Therrestra Materials Lab. 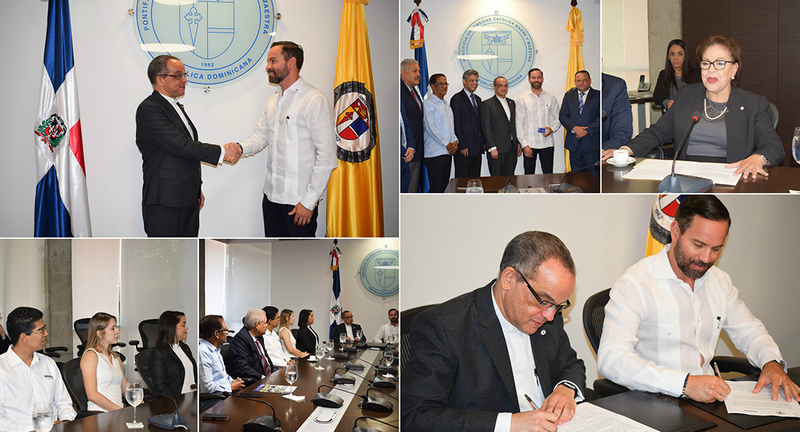 On his behalf, Monsignor Agripino Núñez Collado, Chairman of the Fundación Madre y Maestra, Inc., congratulated Pérez Ovalles for this initiative, hence making him a role model to the over 80,000 university alumni, whom the Foundation aims to link to their Alma Mater, each one within their possibilities, in such a way that Madre y Maestra can continue ensuring world-class educational formation, with equal opportunity to all Dominican families, regardless of their socioeconomic level.